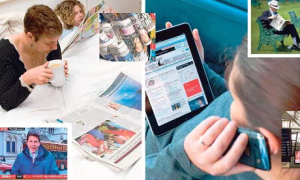 Out of the ¬10,000 news stories you may have read in the last 12 months, did even one allow you to make a better decision about a serious matter in your life, asks Rolf Dobelli. Take the following event (borrowed from Nassim Taleb). A car drives over a bridge, and the bridge collapses. What does the news media focus on? The car. The person in the car. Where he came from. Where he planned to go. How he experienced the crash (if he survived). But that is all irrelevant. What’s relevant? The structural stability of the bridge. That’s the underlying risk that has been lurking, and could lurk in other bridges. But the car is flashy, it’s dramatic, it’s a person (non-abstract), and it’s news that’s cheap to produce. News leads us to walk around with the completely wrong risk map in our heads. So terrorism is over-rated. Chronic stress is under-rated. The collapse of Lehman Brothers is overrated. Fiscal irresponsibility is under-rated. Astronauts are over-rated. Nurses are under-rated. Out of the approximately 10,000 news stories you have read in the last 12 months, name one that – because you consumed it – allowed you to make a better decision about a serious matter affecting your life, your career or your business. The point is: the consumption of news is irrelevant to you. But people find it very difficult to recognise what’s relevant. It’s much easier to recognise what’s new. The relevant versus the new is the fundamental battle of the current age. Media organisations want you to believe that news offers you some sort of a competitive advantage. Many fall for that. We get anxious when we’re cut off from the flow of news. In reality, news consumption is a competitive disadvantage. The less news you consume, the bigger the advantage you have. News feeds the mother of all cognitive errors: confirmation bias. In the words of Warren Buffett: “What the human being is best at doing is interpreting all new information so that their prior conclusions remain intact.” News exacerbates this flaw. We become prone to overconfidence, take stupid risks and misjudge opportunities. It also exacerbates another cognitive error: the story bias. Our brains crave stories that “make sense” – even if they don’t correspond to reality. Any journalist who writes, “The market moved because of X” or “the company went bankrupt because of Y” is an idiot. I am fed up with this cheap way of “explaining” the world. Finally, things we already know limit our creativity. This is one reason that mathematicians, novelists, composers and entrepreneurs often produce their most creative works at a young age. Their brains enjoy a wide, uninhabited space that emboldens them to come up with and pursue novel ideas. I don’t know a single truly creative mind who is a news junkie – not a writer, not a composer, mathematician, physician, scientist, musician, designer, architect or painter. On the other hand, I know a bunch of viciously uncreative minds who consume news like drugs. If you want to come up with old solutions, read news. If you are looking for new solutions, don’t.